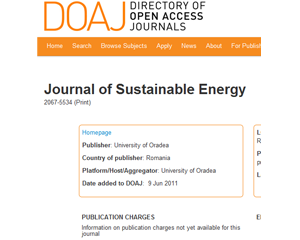 The Journal of Sustainable Energy (JSE) had its first appearance under this name in 2010. The history of JSE is the following: is formed in 2010 by transforming of 1993-2009 Analele Universitatii din Oradea. Fascicula de Energetica, 1224-1261. Which superseded in part (1991-1992): Analele Universitatii din Oradea. Fascicula Electrotehnica si Energetica (1221-1311); Which superseded in part (1976-1990): Lucrari Stiintifice - Institutul de Invatamant Superior Oradea. Seria A, Stiinte Tehnice, Matematica, Fizica, Chimie, Geografie (0254-8593); Which was formed by the merger of (1971-1973): Lucrari Stiintifice - Institutul Pedagogic Oradea. Geografie (1220-2940); (1971-1973): Lucrari Stiintifice - Institutul Pedagogic Oradea. Matematica, Fizica, Chimie (0475-039X); Both of which superseded in part (1969-1970): Lucrari Stiintifice - Institutul Pedagogic Oradea. Seria A (1220-2916); Which superseded in part (1967-1968): Lucrari Stiintifice - Institutul Pedagogic Oradea (1220-2266). Any paper that is related directly or indirectly to energy is welcome. The articles quality increases with every issue. Apart from its improved technical contents, a special care is given to its structure. The guidelines for preparing and submitting an article were modified and developed in order to meet high quality standards requirements. With every passing issue the peer-review process was developed too, being now a simple-blinded peer-review process.